Discover the UNESCO-listed wonders of Pompeii and the lively resort town of Sorrento on this full-day private tour from Rome. First, learn about life in ancient Rome as you explore the mighty ruins of Pompeii and stand in awe before the world’s oldest surviving Roman amphitheater. 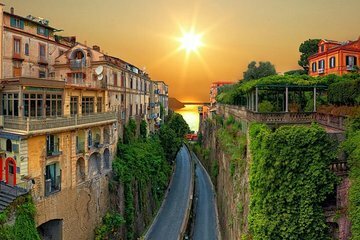 Then, marvel at the startling scenery of the Amalfi Coast, another UNESCO World Heritage site, before visiting historic Sorrento, famous for its magnificent cathedral and lively harbor. Giovanni our guide was great, had nice stop at mozzarella farm, nice lunch recommendation at Sorento. Only downside was the heat at Pompeii. But Giovanni took us to a nice ice cream shop after. Nice day trip from Rome! Drive was comfortable. Ricardo was our tour guide and he is a charming gentleman in every sense of the word. He is so knowledgeable and freely shares all that he understands. His love for Italy is deep and heartfelt. We are so thankful for his company. Driver was great and he recommended we hire a local guide who turned out to be unbelievably knowledgeable and enthusiastic. We paid for two hours and he gave us three! Great way to see the Amalfi Coast and the ruins of Pompei. Our driver Leonardo, as he said, not Da Vinci, was very entertaining throughout our long day. Our guide at Pompei was very knowledgable and easy to understand so we gained a new perspective of the times.